I told you guys a couple weeks ago we sold our family room furniture to my brother and sister-in-law. Since then we’ve been trying to piece together a new family room: new couches, new coffee table, new bookshelves. While we still have a long way to go, I put up some Christmas decorations last week and it’s really starting to feel like home! 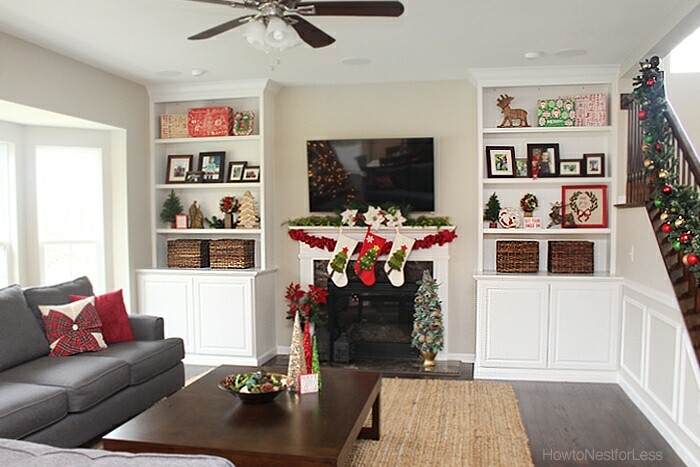 Our new bookshelves got the biggest makeover when I filled them with some holiday goodies. Most of the things we already had from prior years, although I did pick up a few new pieces like the boxes on the top shelves from Hobby Lobby and Marshall’s. Inexpensive way to fill up space for the season. 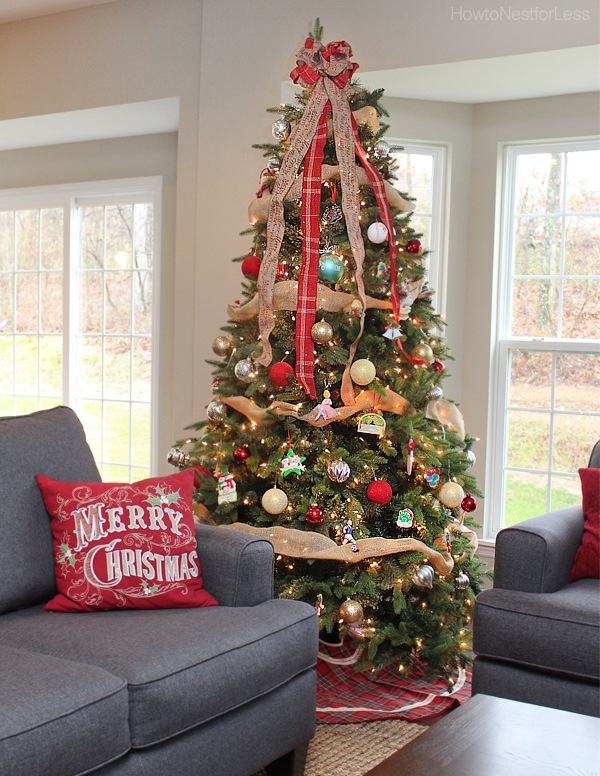 I was trying to think how to tie the new blueish gray couches to the rest of my Christmas decorations when I found the plaid accent pillow from Pier 1 Imports. Seems like a perfect fit with just a hint of blue in the plaid. 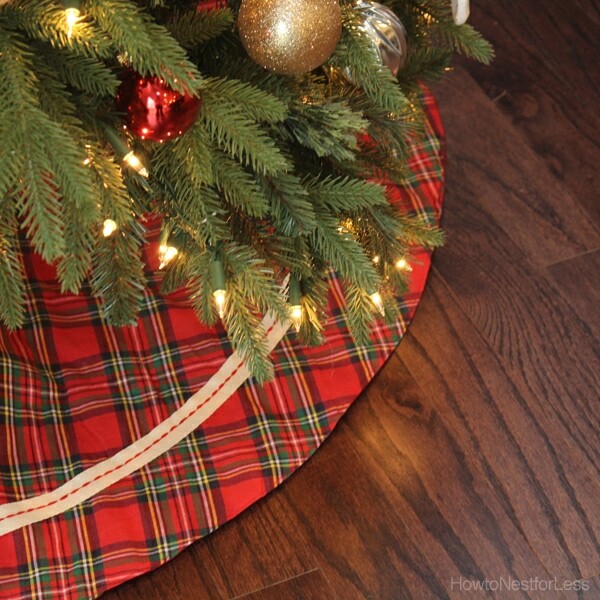 Then I found a matching tree skirt from Marshall’s. Perfect to bring the room together! Our Christmas tree is pretty much the exact same from last year’s sun room. That room is hard to beat, not even gonna lie. Maybe next year I’ll switch up the tree décor, freshen the look. I’ll have to hit up some Christmas clearance sales in January. 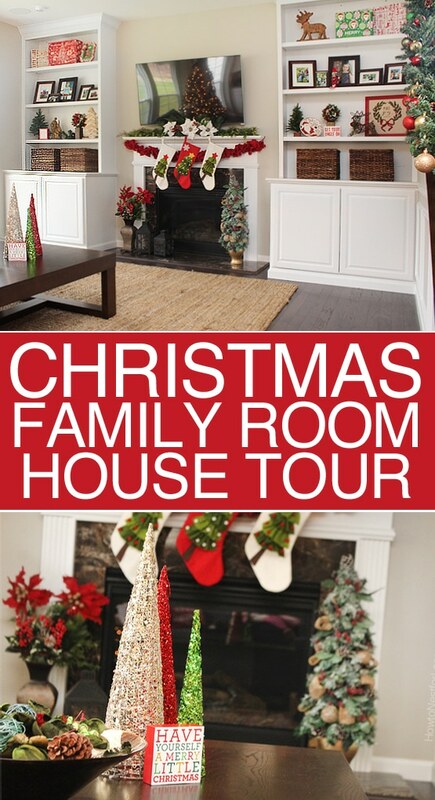 As mentioned we used most things from our old house to decorate this year. I really only spent about $100 on new stuff (the decorative boxes, ruffled garland, tree skirt and pillow). 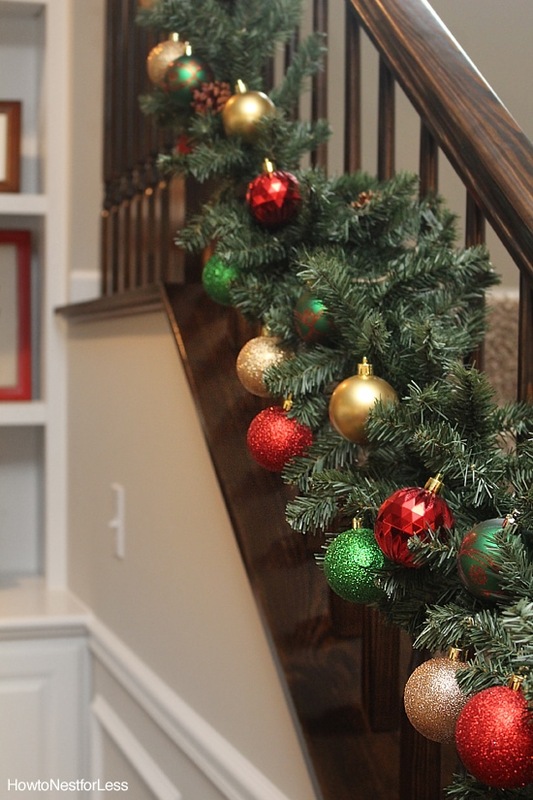 One of my favorite items that I reused was the staircase garland and ornaments. 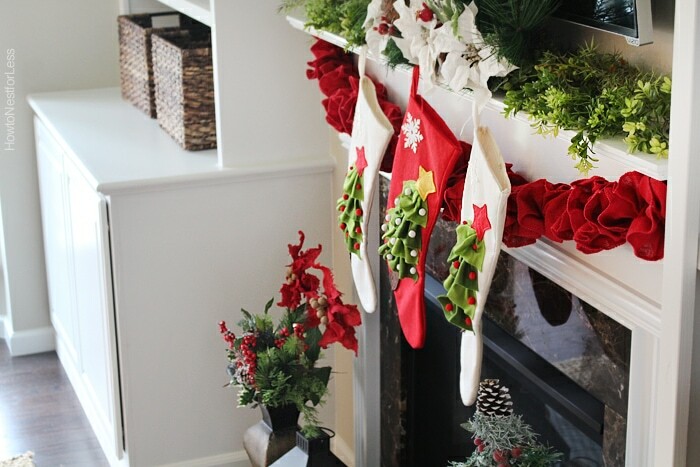 The only thing I switch out from last year’s fireplace mantel was the garland. I found the red ruffled one from Tuesday Morning. I actually bought it to decorate the tree this year but it was too short. Glad it found a new home for it on the fireplace. Love the big pop of red. 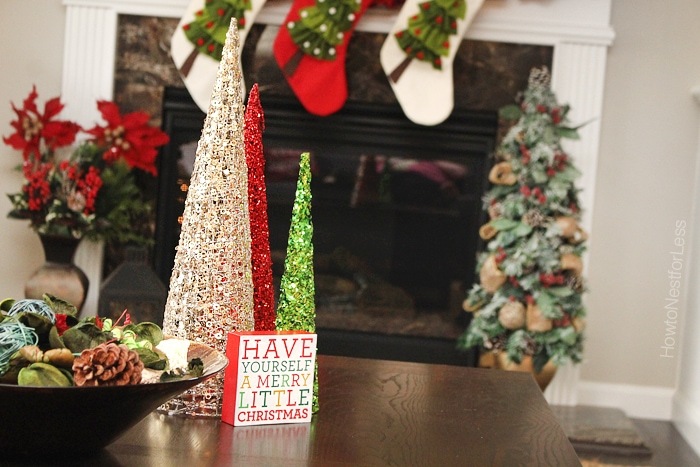 And finally our new coffee table is decorated with some sweet smelling Christmas potpourri and some glitter cones. Might have to rethink the placement of the cones since my 2 year old nephew likes to grab them and walk around our home, creating a trail of glitter wherever he goes. After the holidays my focus is on finishing this room with some new club chairs and curtain panels. Until then I’ll just sit back, turn on the Christmas tree, and enjoy the view. Really looks great. Love your sofa and love seat. Where did you find them? THanks! They’re from Weekends Only in STL. Thank you Annie. Hope you’re doing well! 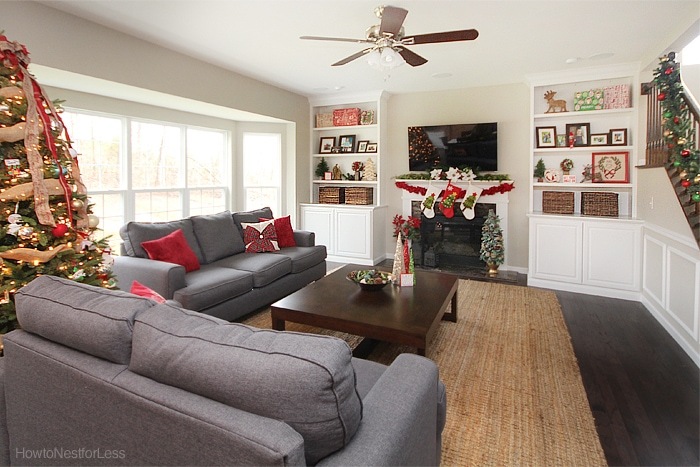 Your family room is so bright and inviting! 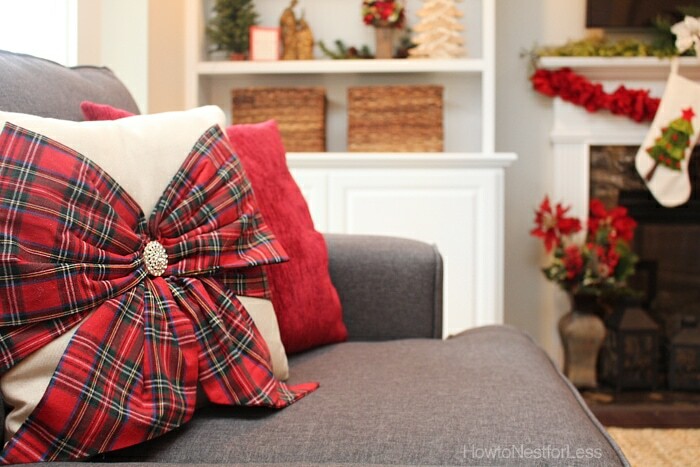 Love your decorations and the bow pillow is adorable! Beautiful decor and gorgeous home! Thanks for sharing. I love everything about this! 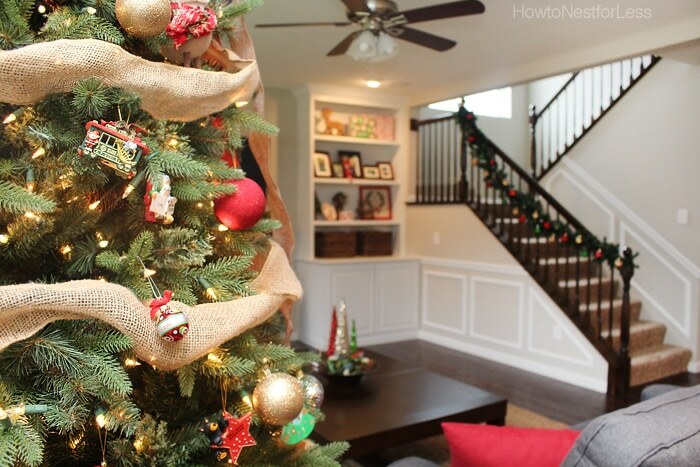 The garland on the stairs is fantastic. LOVE all your windows!!! What a beautiful room! What a beautiful space you have here. 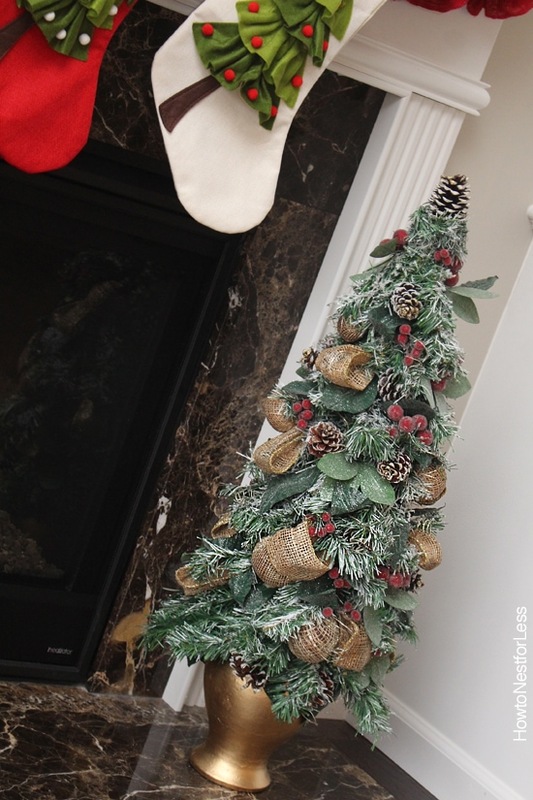 And the decorations are just the right touch to add Christmas cheer to the atmosphere. I love that tree.